Our July meet up was all about bread. We had a go at four different sorts and we liked them all. We liked them even more with some ace local butter and cheese on the top. Why don’t we make bread more often? Easy peasy, quick and so delicious. So what did we make? 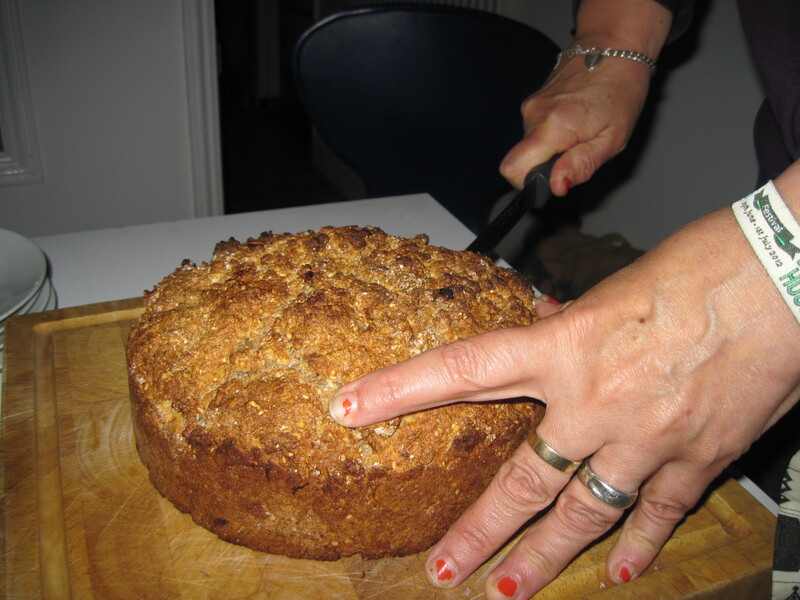 First we made a loaf called Auntie Mary’s Super Soda Bread which claims to be a foolproof recipe needing no kneading (ha ha), no proving, no skill and no time – so right up our street. It was quicker than quick to make, just mix everything in a bowl and then stick in the oven. We used a spelt flour which none of us knew much about but if you’re interested there’s a lot of info on the Sharpham Park website. It’s a healthy alternative to wheat flour dubbed by the Romans as “the marching grain” due to it’s high energy content. 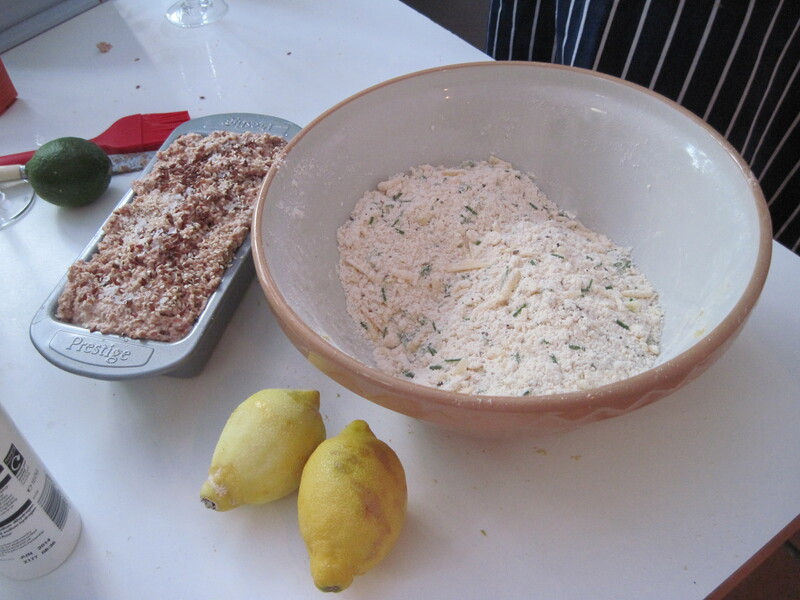 Put one carton of buttermilk in a bowl, add one third of the flour and all the seeds. Add the second pot of buttermilk, the remaining flour, oats, sugar, salt and bicarb. Mix well. Grease a round baking tin and tip in the bread mixture. Smooth the top and give the tin a bash to make the mixture settle. Bake for an hour at 190C/375F. 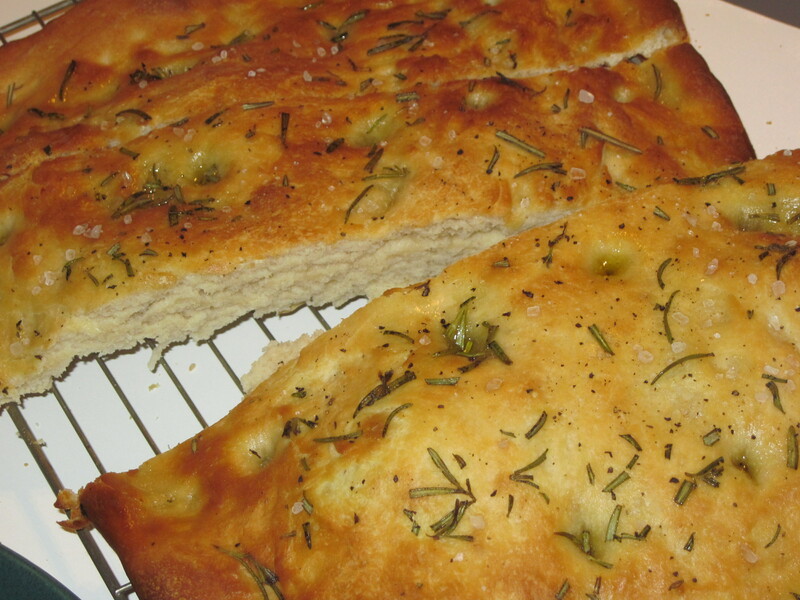 While that was cooking we started on the others – Easy Soda Bread, Lemon Pepper Bread and Focaccia. 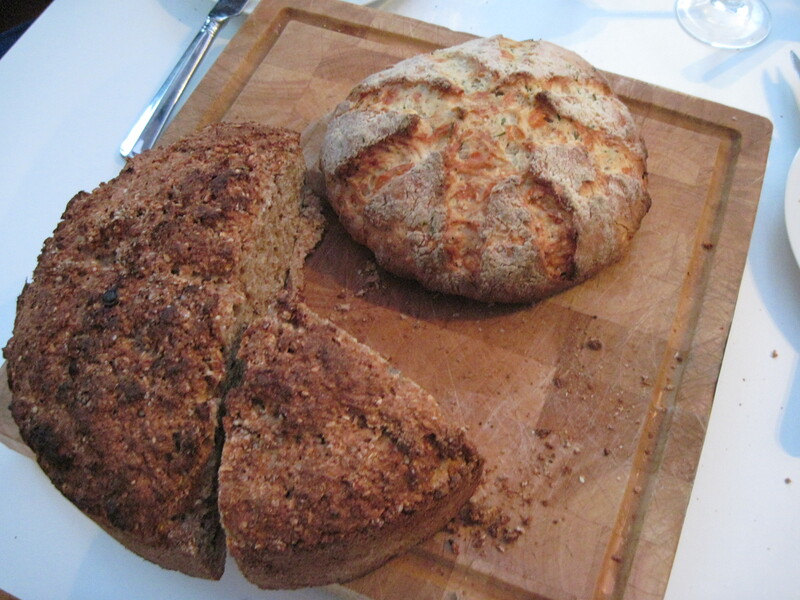 The second soda bread was exciting as it used fizzy soda water and again very healthily, included lots and lots of seeds. Incidentally when Gilly was confusedly stood staring at the all the flours available in the shop she asked a bread-making lady (how did she know?…) what she would recommend and she was told Canadian flour is best for bread. Not sure why but not good for our LOCAL support. Combine all dry ingredients thoroughly. Make a well in the middle and add the soda water – it will fizz up immediately inducing squeals and shrieks (or is that just us?) Combine everything and tip into a loaf tin. Sprinkle with more seeds and bake at 200C for 45 to 50 mins, a skewer should come out clean when it’s done. Kaboom…done. Lemon Pepper Bread was next. 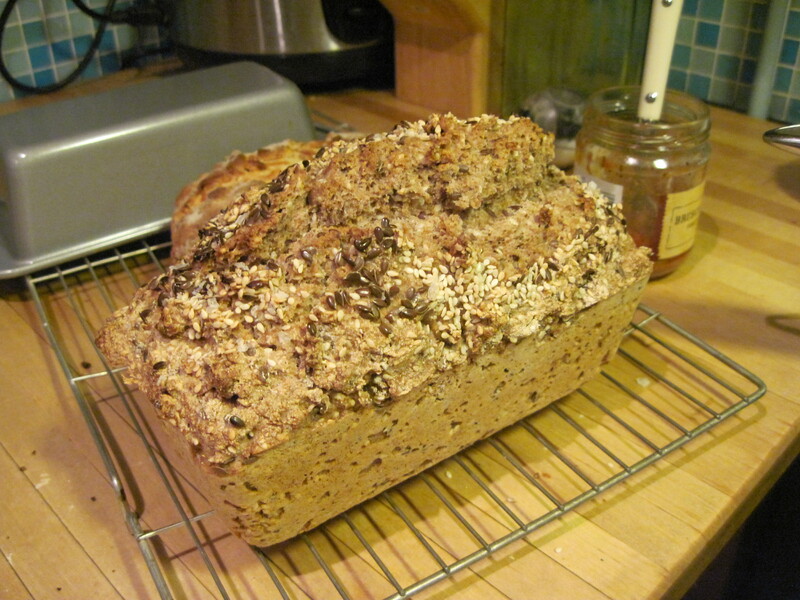 Not a soda bread this time so required some kneading but no proving so still a quick recipe. The smell of the lemons and pepper was heavenly. Sift the flour and salt into a bowl. Add the lemon and pepper then rub in the butter to like you are making pastry. Stir in cheese and chives. 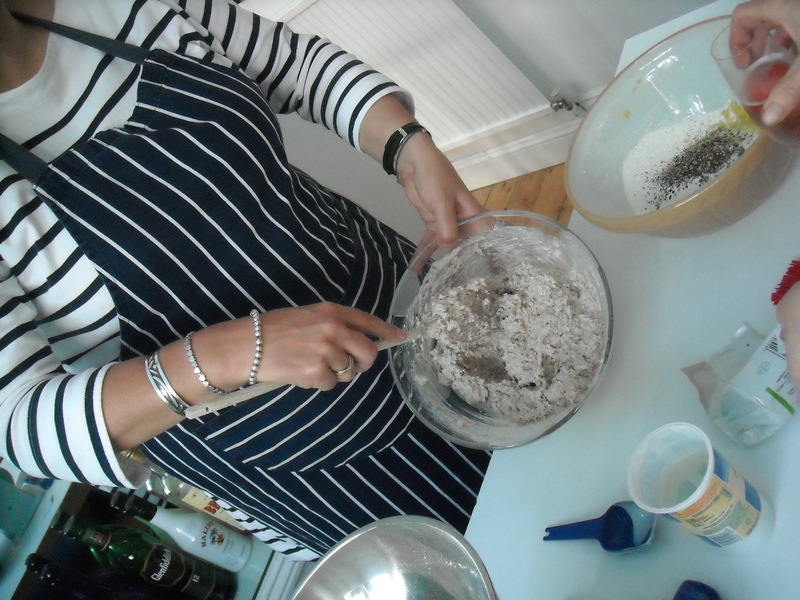 Mix the milk and vinegar together and don’t worry if it looks curdled then add to the flour mixture and mix to a soft dough. Knead until smooth. Divide into two, place on a buttered baking tray and press each out into a circle about an inch thick. Score into wedges and dust with flour. Bake for 20 to 25 mins. It will be deep golden when ready and make a hollow sound when tapped on the bottom (as I do. Actually,… depends who’s doing the tapping). Put the flour, yeast, sugar and salt in a bowl. Mix the oil and water then pour onto the flour. Stir with a spoon then bring together with your hands to make a ball. Knead for 5 mins then put in an oiled bowl and leave to prove for an hour while you have a drink. Knock it back and push out to a rough rectangle on an oiled tray. Cover and leave in a warm place to prove for 30 mins. Have another drink while the oven preheats to 220C/425F. After 30 mins, use your finger to make dimples in the dough then drizzle with the oil, sprinkle with the salt and black pepper and chopped rosemary. Stick some little sprigs in too. Bake for 15 to 20 mins until golden brown. 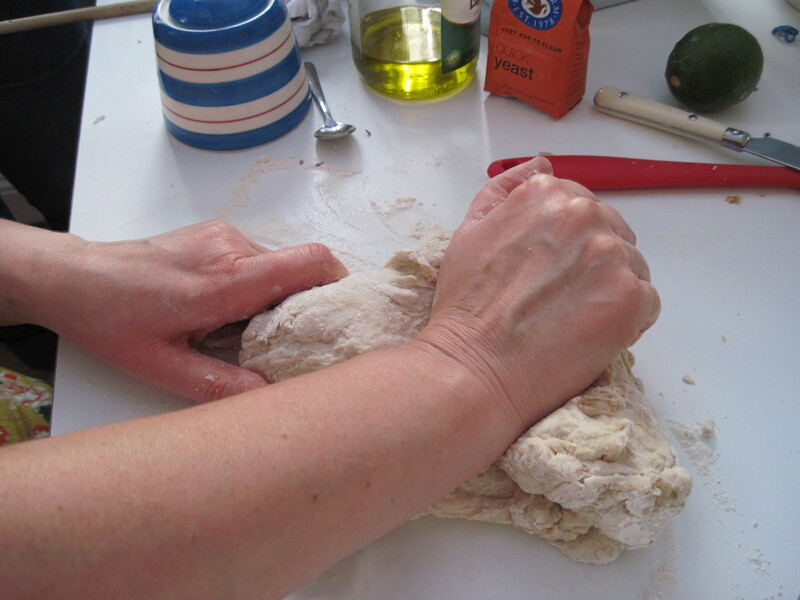 LOOK AT OUR LOVELY BREAD…. The smells in the kitchen were making us VERY HUNGRY and as we staggered the baking we had to resist from eating too much of the first cooked loaves so we had room to try all four. Resistance is not one of our strong points but we tried. We ate the bread with a selection of local butter and cheese which we bought from Mill Farm Shop just off the A31 on the way to Alton – really worth a visit for local produce and their own organic meat. 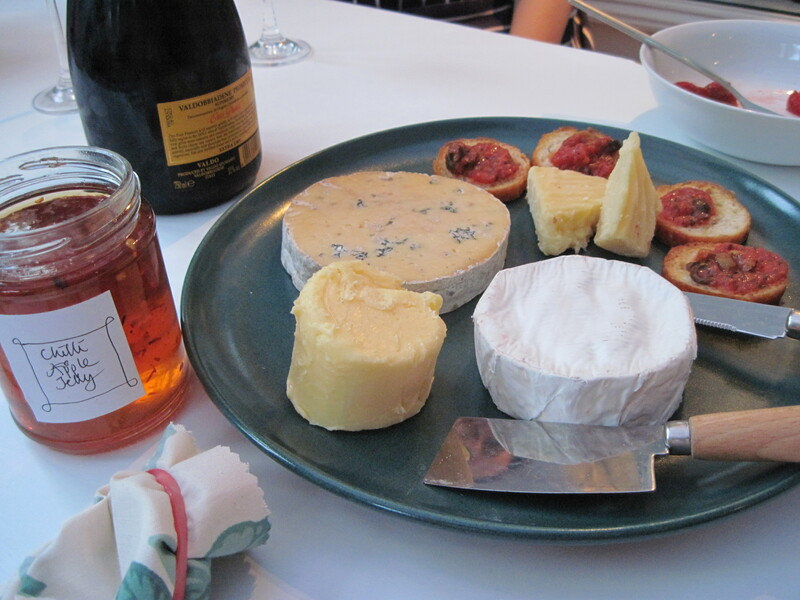 Cheesewise, we had two delicious ones from award- winning Loosehanger Farmhouse Cheeses near Salisbury – a creamy, mild, blue Old Sarum and a soft, mold-ripened White Hart. We also had the rest of the tasty Sussex Charmer left over from the Lemon Pepper Bread and South Downs butter made by the same producer – Bookhams in West Sussex. The butter was a revelation, absolutely lucious and very different to bland supermarket stuff. Oh and we had some ace Chilli & Apple Jelly made from Mill Farm apples – we liked that a lot too. 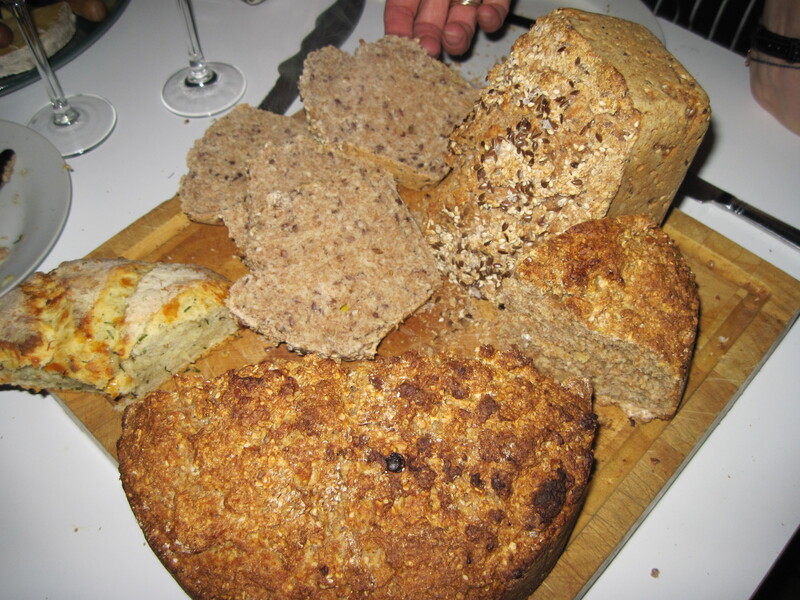 Oh and we didn’t eat ALL the bread that evening…we each had a proper bread basket to take home to our families and we are happy to report that all the breads were still delicious the next day – the soda breads are great for toasting. YUM.